Karen Deeny, Pip Hardy and Tony Sumner summarise their shared experiences and reflections of the ‘DNA of Care’ staff digital stories project. They bring a great breadth and depth of insight into healthcare staff and patient experiences, improvement methodology and research into improving experiences of care. Acknowledging the inextricable link between staff experience and patient experience, in 2016 NHS England funded the ‘DNA of Care’ project. 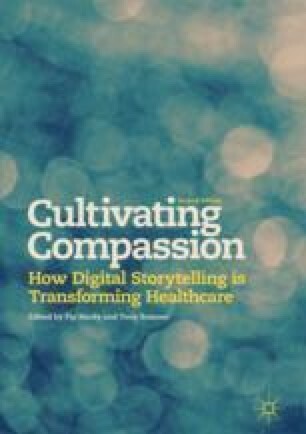 In five Patient Voices workshops, staff created digital stories about what really matters to them. Deeny, Hardy and Sumner illuminate the process, capturing the need, learning and multiple impacts. They highlight the relevance and potential applications of this approach and call for more compassionate leadership and workplaces, and more integrated approaches to improving experiences of care for all. Hardy, P., & Deeny, K. (2017). The DNA of care: The importance of listening to staff stories NHS horizons. Retrieved from http://theedge.nhsiq.nhs.uk/march-2017-dna-care-importance-listening-staff-stories/. (2017 printing).